TNT Performance Products does a trick job in creating a fairly real HyperGlide 7 speed freewheel. The basis of this freewheel is the Shimano MF-7400 freewheel body. You know, the freewheel we spoke so highly of, just two items ago. We won't re-describe the MF-7400 body, but remember we said that HyperGlide cogs weren't made to fit it, just UniGlide? Remember, also that all Shimano cogs made in the last decade are 1.9mm thick, so we know the difference in all their index systems is really the spacing? Well, if you take the HyperGlide cogs used in the MF-HG20 freewheel above, and grind just slightly, one of the interior notches that slides into the freewheel body, it can be made to fit perfectly onto the 7400 body. Remember, the shape and design of the teeth on the MF-HG20 cogs are the same as those used in the HG50, 70, and 90 cassettes, they are functionally the same. 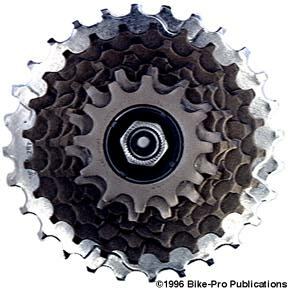 The TNT freewheel uses the second through sixth position sprockets from the HG20 freewheel. To hold everything together, securely, TNT uses the first and second position cogs from the original MF-7400 freewheel. 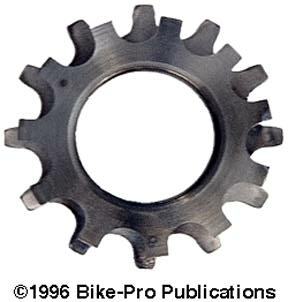 These two sprockets both thread onto the body exterior at the outer end, granted they are UniGlide by design, but in the case of cogs this size, any performance variation is absolutely indiscernible. Incidentally, TNT elects to re-use the four steel 3.0mm spacers which weigh 51 grams. We'll bet some day that they make their own aluminum spacers for this product. The TNT Modified 7400 HG Freewheel is available in 2 sprocket combinations. For those who own, or are going to buy a MF-7400 freewheel, this is an interesting option, provided you intend to use the freewheel on a rear axle that has a 135mm over lock nut dimension. This TNT cog replaces the stock 12 tooth steel, Unglide, first position cog, with a custom manufactured, beautifully machined from one piece of steel, an 11 tooth and 12 tooth Uni-like, (by tooth height and thickness) cog which replaces the original12 tooth Shimano first position cog. The next leap in modified freewheels. TNT now takes the 7 speed modified freewheel two items up, and adds to it the 11/12 combination cog just previous, and what we have is an 8 speed modified MF-7400 Dura-Ace freewheel. 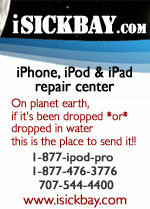 This is available in 1 sprocket combination. TNT Performance has replaced the steel lock ring on HyperGlide cassette cog systems with a locking 11 tooth cog that threads into the freehub's interior threaded end, holding the entire cassette together while building it out with one more gear. Shimano provides a 4mm axle spacer on the non-drive side of the axle, (HG cogs are 1.9mm with 3mm spacing, and the .9mm deficiency can easily be made up in splaying the dropouts). You move this 4mm spacer to the drive side, then install the lock ring/11t cog. This is a clever idea to convert existing 7 speed cassette hubs to 8 speed. 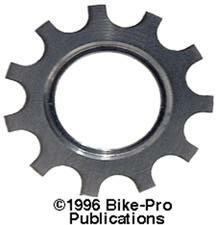 This 11 tooth Speed Sprocket is available in both steel and Titanium.